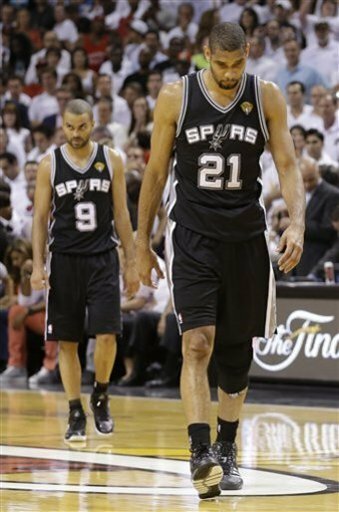 I am a San Antonio Spurs fan. I live in the Philippines and was introduced to NBA when I was in high school. Back then, there are only few teams from the NBA that I know of. Pistons, Celtics, Lakers. Then I learned of the Bulls, Knicks, Hornets, Rockets, etc. Then came 1997 when I learned of the Spurs with then Center, David Robinson. I found this guy to be a gentle-giant. 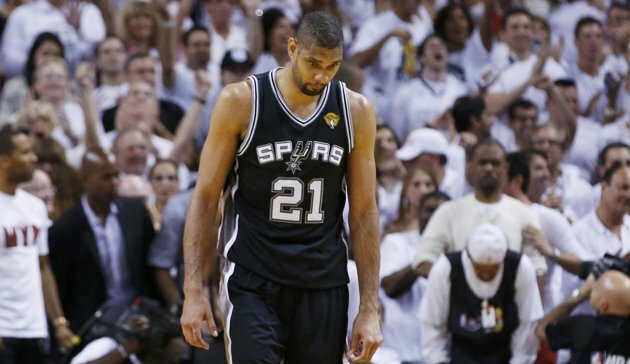 He’s a gentleman on his own right and then came Tim Duncan. I was so frustrated back then when David Robinson retired. 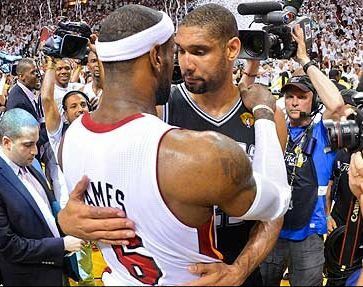 But before he left, I have seen how he trained Tim Duncan on the lowpost. I saw him “pass the torch” to this young man who rarely shows his emotions and most of the times, keeps his emotions in check. 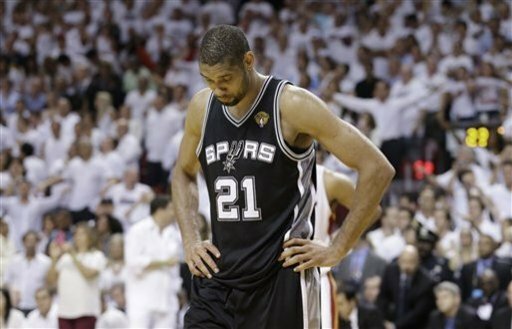 I saw how Tim Duncan became the MVP for the 1999 season. And he won 3 more championships after that. Now, reading Wikipedia, I saw that for this season, 2013. Tim has had some personal issue and says that he and his wife had been divorced. But still, his game was stellar and his leadership excellent. 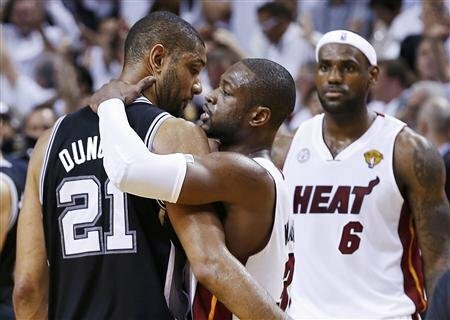 When the Spurs were waiting for the Finals opponent, I mentioned to a friend that IF the Heat wins against the Spurs, their championship against OKC will be solidified and they will really be a great team, but if they lost to the Spurs, they’re just a group of wanna-be’s. 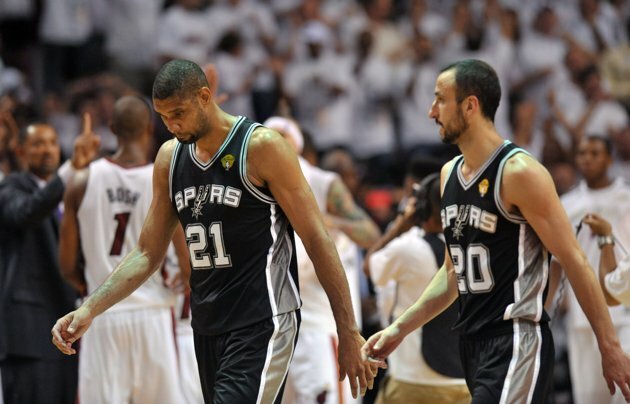 The Finals were set, and down to Game 7, the Spurs lost to the Heat, which broke my heart. 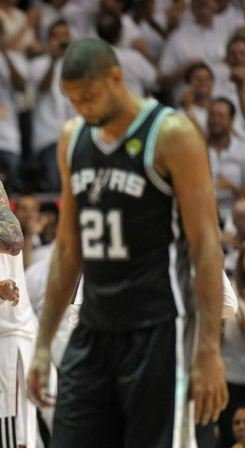 And it broke my heart further seeing pictures of Tim Duncan who, I know he walks with his head looking at the ground/bowed, but on this game, it seems that he carried the load too much and even goes on blaming himself that they lost. I thought that he should have his head up high for he has nothing to be ashamed of. He has nothing to prove because people know how great a person and a player he is. Even his opponents know how great a guy he is. 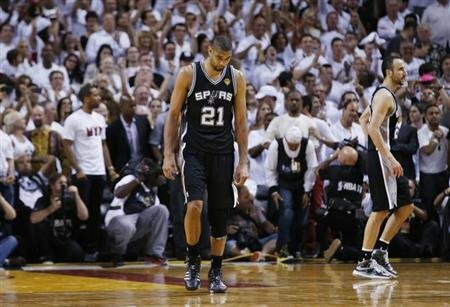 Even Shane Battier said: “That’s a shot Tim Duncan usually makes eight out of ten times. For whatever reason that shot didn’t drop right then. I’m very thankful. It wasn’t because of my defense. 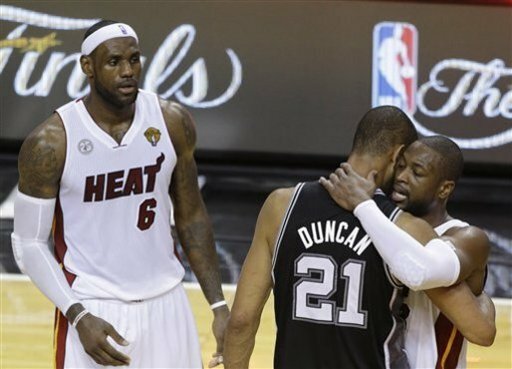 Just missed it.” Even Dwayne Wade is fond of him and LeBron James. 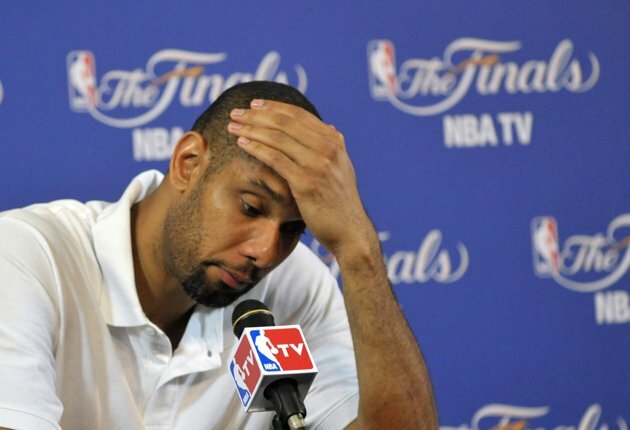 I am a San Antonio Spurs fan. And will still be a fan. I have been wanting to write this article for a long time now. I’ve been looking forward to have this posted on my blog site. Charice Pempengko. Arnel Pineda of Journey. APL of Black Eyed Peas. Manny Pacquiao. Lea Salonga. What do these people have in common? They’re all Filipinos. And they have already achieved their dreams. And they’re proud Filipinos. Reality check. THEY ARE PROUD FILIPINOS. Basically, there’s nothing really wrong here. Except when you say, “I am a PROUD FILIPINO because of these people. “Did I just hear you say, “you’re a proud Filipino because of some other Filipinos?” come on, that didn’t sound right! Most Filipinos claim that they’re PROUD FILIPINO because of an external factor. ESPECIALLY after PacMan wins a fight! It would seem as though that we’re the ones fighting in the ring and not Manny. There’s really nothing wrong with applauding for Manny or the others, what’s wrong is when one says that he’s proud to be Pinoy because of Manny and the others. Or he’s proud because of what Arnel Pineda, Charice and APL are singing on stage. PRIDE should be from within. 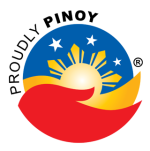 We should say, “I am a proud Filipino because I am a Filipino.” It should be from the inside looking out, not the other way around. Pride should also know when to stop. We became delusional and grew up thinking that we are better than the others. Even locally, Tagalogs think the Bisayan speaking people are inferior to them. That everyone who speaks with a strong accent is Bisaya. We are a nation of racists. We hate racism, but we can’t face that fact. We can’t stare in the mirror and say that we need to change. Change our attitude. Be humble. I am not sure about the Filipino pride but we are also in a society of fixers, corrupt officials, law-breakers, child-abusers, kotong cops, government syndicates, customs robbers, MMDA idiots, immigration scumbags, spoiled priests, and jejemon youth… collectively known as PINOYS. I don’t want to be called PINOY by the way. I am not PINOY. I AM A FILIPINO. And a proud one at that. Filipinos have lost the true essence of being a proud Filipino. We have lowered ourselves to the negativities around us. I am still hoping for a better Philippines. 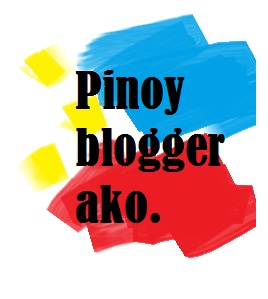 For a better Filipino.